Feb 03, 2018 The Protein Cookie Co. Review — The BEST Protein Cookie! The Protein Cookie Company Protein Cookie will be shipped separately from the supplier and may take up to 5 business days for delivery. Trust us - its worth the wait! This classic treat will take you back to Grandma's Kitchen where you enjoyed fresh warm chocolate chip cookies for the very first time. Our Classic Chocolate Chip Protein Cookie is moist, full of flavor and delicious to the very last bite. Each cookie is made with Cold Processed Whey Isolate and Whey Concentrate designed to deliver up to 17g of protein per serving. Every cookie is baked fresh with vitamin enriched soft white wheat ﬂour, stevia and Guittard chocolate chips. But, we didn't stop there, we finished the product with natural coconut oil and sea salt to deliver not only the benefits of essential fats but also the moist chewy taste that a cookie is supposed to have! This "Macro Friendly" cookie is perfect as a snack or tasty late night treat. Hint: Eat cold or warm with non-fat yogurt or ice cream for a guilt free dessert! ATTENTION CHOCOLATE LOVER'S! This cookie was made just for you. The Protein Cookie Company's Dark Cocoa Chocolate Chip cookie is a dream come true. Rich chocolate ﬂavor with just a hint of decadence, sets this cookie apart from anything you've ever tried. Oh.. and did we forget to mention it was packed with close to 19g of Whey Isolate and Concentrate? Baked with vitamin enriched soft white wheat ﬂour, stevia and 72% dark cocoa powder, this is your only choice when you're dying for a delicious treat. Infused with GuittardTM chocolate chips, coconut oil and sea salt, our Dark Cocoa Chocolate Chip cookie is the perfect healthy snack. What would the world be like without Oatmeal Raisin cookies? This traditional favorite is a perfect partner to your morning cup of joe. Packed with 100% Natural Whey Protein Isolate and Concentrate, fresh rolled oats, as well as premium raisins, makes this is a cookie that is guaranteed to please. Like our other cookies each Oatmeal Raisin Protein cookie is hand made with vitamin enriched soft wheat ﬂour, stevia, and coconut oil for essential fats. This "Macro Friendly Cookie" is perfect for low carb diets, a tasty snack or treat. Hint: Eat cold or warm depending on your mood. Something about peanut butter cookies brings a smile to everyone's face. Our Classic Peanut Butter Protein cookies are rich, moist and delicious. Made with 100% Natural Whey Protein Isolate and Concentrate, these cookies are destined to be a muscle fortifying favorite! 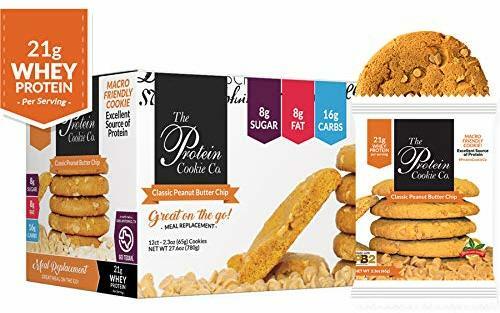 Each cookie is freshly made with vitamin enriched soft white wheat ﬂour, stevia, powdered peanut butter and a plentiful serving of peanut butter chips. This cookie is a peanut butter lover's dream come true. This "Macro Friendly" cookie can be enjoyed warm, cold or at room temperature and is perfect for an afternoon treat, or late night craving buster. Hint: Eat cold or warm with non-fat vanilla ice cream or yogurt for a guilt free dessert. Eat Right and Have Your Cookies Too?" Our Goal is To Make It Possible to Enjoy Delicious Baked Goods Without Sabotaging Your Diet and Training Efforts. All Protein Cookie Company cookies are baked fresh from scratch using the ﬁnest ingredients. We have created a Natural Proprietary Whey Isolate/Whey Concentrate Blend that is sweetened with Stevia. We designed our blend specifically for optimal baking integrity and increased nutritional value. The blend is cold processed thus retaining many of nutrients like easily-absorbed amino acids and metabolism-boosting peptides, along with antioxidants and alkaline minerals. Stevia has Zero calories, Zero carbs and Zero glycemic Index. Cocoa contains three flavonoids: Procyanidin, catechin, and epicatechin. When cocoa is processed with fat and sugar you lose all its health-supporting benefits. Therefore we use a cocoa powder that is 72% pure cocoa in our dark cocoa cookie recipes. Coconut oil has an unusually high amount of medium chain fatty acids or triglycerides (MCFAs or MCTs), which are harder for our bodies to convert into stored fat and easier for them to burn off than long-chain fatty acids or triglycerides (LCFAs or LCTs). The Protein Cookie Company is a fast growing company supported by macro dieters, macro coaches, bodybuilding and ﬁtness athletes, health conscious mothers, post-op patients and many others who are looking for new and great tasting ways to ensure their diets have the protein necessary for recovery and support. Our cookies are packed with cold processed whey isolate and concentrate as well as other premium ingredients. We know that taste is everything when you're looking for that special something to bust a sugar or carb craving and the team at The Protein Cookie Company works hard to build recipes that are delicious and meet the needs of dieters, athletes and ﬁtness enthusiasts of all ages.